Next generation online picture making tool for sharing with your friends, on facebook, on your blog, etc. This is the most advanced form of photo booth. The web based photo booths are so much liked by the online patrons that they just can't resist to click pictures and edit the same. They are so fantabulous that your photos will be cherished and preserved for the lifetime. There are many satisfied customers who have discovered how important the photo booth is for cherishing and memorizing. You need to personally find it out yourself to understand the goodness of the web based photo booths. 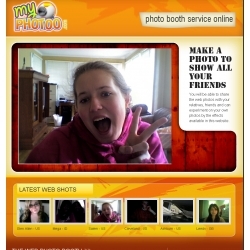 The web photo booth is so amazing that the webcam shot can be uploaded to the free sharing website so that the pictures can be placed either in the social website or can be emailed to your friends.